The one thing that I really enjoy about being in the southern USA in the winter is that I get to see many of the birds that occur in the Foam Lake area during the spring and summer months. At the moment only a few have come down here so far; the rest are still up north or in the early stages of migration. The few that have arrived are: White Crowned Sparrow, Say’s Phoebe, Northern Harrier (Marsh Hawk), Willet and Widgeon. Why did this particular bird get named “Turkey’ and not something else? It was a promotional gimmick. When the turkey was brought to Europe several centuries ago it was felt that people would not be inclined to eat this particular fowl if it came from Mexico, so it was promoted as exotic fowl from Turkey or Turkey fowl. Whether this made a difference in its popularity is unknown, but the name stuck. When Europeans first arrived in the new world the Turkey was common throughout eastern North America from southern Ontario to Central America. Apparently the Turkey of that era was very tame and confiding, and along with its large size, was easy prey for hunters and was nearly wiped out. (Who doesn’t know the story of the Pilgrims)? Bird books of the 1950”s describe the Turkey as being quite rare and found only in the most secluded and out of the way places in the south eastern USA. How times have changed. It seems the stupid ones have been exterminated leaving only the bright ones, and with the help of Turkey hunters it has been restored over all of its former range and beyond. I saw my first wild Turkeys in the Winnipeg Zoo some thirty years ago. These were not captive birds but wild ones that had come to the zoo to feed on whatever the zoo had to offer. It was quite a sight to see this small flock fly away. To Winnipeggers living along the Red River it has become a nuisance because of the mess it leaves behind as it visits backyards and patios. Since then I have seen them in southern Manitoba and in the Qu’appelle valley near the town of Fort Qu’appelle. This week’s photo was taken in the Cayumaca Park near Julian, CA. 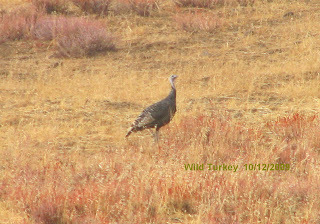 I was very fortunate to get these pictures as Turkeys are very wary of humans and upon sighting them they usually flee. Perhaps they knew they were in the park? They are spectacular birds that require no description as they are very similar to the domestic Turkey. It is probably only a matter of time before they are spotted in the Foam lake area. Who knows? However, observers should keep in mind that for many years Sandhill Cranes were called wild Turkeys. Why? Because during migration ducks and geese could be identified, but flocks of other large birds with a distinct sound could not. Looking around the farmyard, farmers assumed that these other birds must be turkeys. What else could they be? Had the early settlers known that turkeys are not migratory, this error would not have occurred. 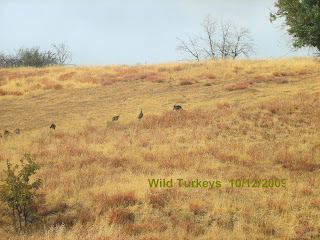 So, beware of reports of wild Turkeys being common many years ago. They are not native to the prairies. One of the birds that I really enjoy watching around here in coastal California is the Brown Pelican. It is a ponderous turkey sized brown bird that occurs along both coasts of North America from Mexico to Canada (southern BC only). World wide there are only eight species of pelicans two of which, the Brown and American White, occur in North America. The Brown is a bird of sea coasts while the White is an inland bird that prefers fresh water. Both will occasionally stray from their usual habitats especially in winter. There is very little to say about pelicans in the way of description. It really cannot be mistaken for anything else. The defining characteristic of a pelican is its very large bill which it uses to catch fish in water. The Brown Pelican glides gracefully, usually in short lines of several birds, low over the waves and then dives down head first into the water to catch a fish. Its bill has a huge stretchable pouch under the lower mandible that holds the fish and up to a gallon of water (by some accounts). When the pelican comes to the surface, it holds its bill downward and lets the water drain out retaining the fish inside the bill to be swallowed later. It is at this time that gulls often harass the pelican in an attempt to force it to give up its catch. Occasionally, the tactic succeeds. The young are raised by both parents. The adults catch prey in the ocean and then fly some distance inland to their brood. Like most sea birds, pelicans nest in colonies. In the minds of humans, most young birds and animals are very cute and cuddly. Who can resist cuddling a duckling or a puppy? For reasons right or wrong, it was this human trait that anti sealers used to turn people against the annual seal hunt by showing cute and cuddly seal pups being harvested. In this same vein, young pelicans have got to be the ugliest babies possible. They are large billed, naked and awkward with eyes that appear to be on the top of the head. Overall, they seem to be something out of a Jurassic Park movie. However, I am sure the parents think otherwise. Not only can Brown Pelicans be easily observed flying over the water and feeding, but they are quite trusting of humans and often sit on posts, buoys, docks and even moored boats providing good views. Getting a picture of one is not hard. Males and females are the same. They are usually silent so, unlike gulls and terns, they do not make any noise letting one know that they are present, but their size and tameness more than make up for it.